We no longer update this blog- please check our website! 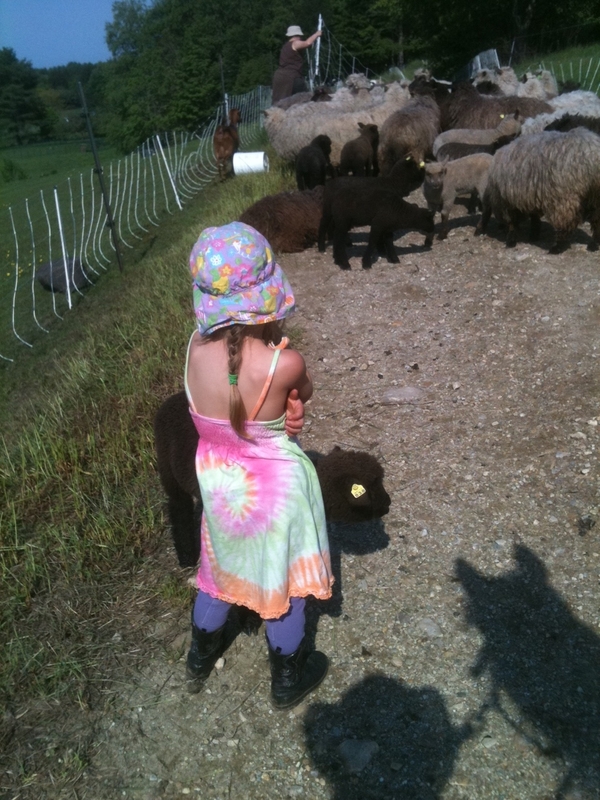 Go to www.holidaybrookfarm.com to see what we are up to at the farm. Thanks and be well. We’re very excited to announce that our new website, including online CSA membership capabilities, is looking great and is nearly ready to launch! It sounds like we won’t have online credit card processing totally functional until sometime next week, but signups should be ready to roll as soon as we complete the switchover. Stay tuned! We are gearing up for the new season! Seeds are ordered- we are looking at new vegetable equipment and we are starting to get excited. Planting in the greenhouse starts next week, so does the next round of hoophouse greens so that we can get a jump on early greens! Our new CSA brochure is ready to download, paper ones will go out in the mail tomorrow to all of last year’s members- there have been a few changes, but one of the bigs ones is that starting around March 1st we will have a new website and folks will be able to sign-up and pay on-line, set up payment plans and all that fun stuff that has been a book-keeping struggle for us for years. We will also be delivering boxed shares to the Farmers’ Market in Lanesboro on Wed & Sat so if you know of anyone who has been holding back on joining the CSA because they didn’t want to make the trek all the way to the farm- this is their chance to get in on the freshest produce around. We are looking for apprentices- send strong backs and smiling faces our way! Susan & Tony send everyone their regards and asked us to tell you about their new CSA farm in South Dartmouth, MA, Apponagansett Farm in case you have friends or family out their way! Their Amelia is getting so big and is smilingly adorable- we go to see them all when they came out to bottle maple syrup for their new farmstand. We are so excited to have yet another set of apprentices become farmers- it means that we are fulfilling one of our missions- to educate/train/influence new farmers. In a country where the average age of farmers is drastically rising closer to retirement- we need innovative and educated young farmers to move into this field- someone has to grow the food of the future. PS. the sheepies are getting very wide- we should have the first of our lambs (and a few kidlets, as Penny the goat will have birthed hers as well) in April this year- we will let you know since you are welcome to visit! New piglets will have arrived by then as well (yep. and it is free. we don’t charge to see baby critters on the farm. we get way too much joy in sharing them with our community). As many of you may or may not know, Des & Jesse added another little person to their family in June- Gwyneth was born on the 9th, 6lbs 3oz right into the chaos of summer on the farm. In the month since her arrival she has witnessed the birth of the first of this season’s calves, the farm store’s opening, the first haying (her dad was putting some of the summer’s first hay in the barn while her mom was in labor), the start of the CSA season and so many other things. June is our heaviest workload month because everything is happening all at the same time. Compost season is slowing down, but we are still making deliveries, haying is starting, the bulk of the veggie transplants need to get in the ground along with lots of direct seeding, harvesting AND animals start to need moving on an almost daily basis to keep up with the grass. Whew. Lots going on, and then, little Gwyneth arrives right in the middle of all that and everyone keeps asking, ‘well, are you getting any sleep?’ and ‘how are you getting anything done?’ and the answers are relatively simple- ‘No, we’re not sleeping, but that doesn’t have as much to do with Gwyn as it does about all the things we need to get done’ and ‘We don’t get everything done, but we are getting as much done as we can, and we have GREAT apprentices who are pulling more than a little of the weight.’ That and we are behind on the dishes, the laundry and what all, but since we spend most of dawn to dusk outside it doesn’t really seem to matter that much until we can’t find shorts or socks for the kids or us. 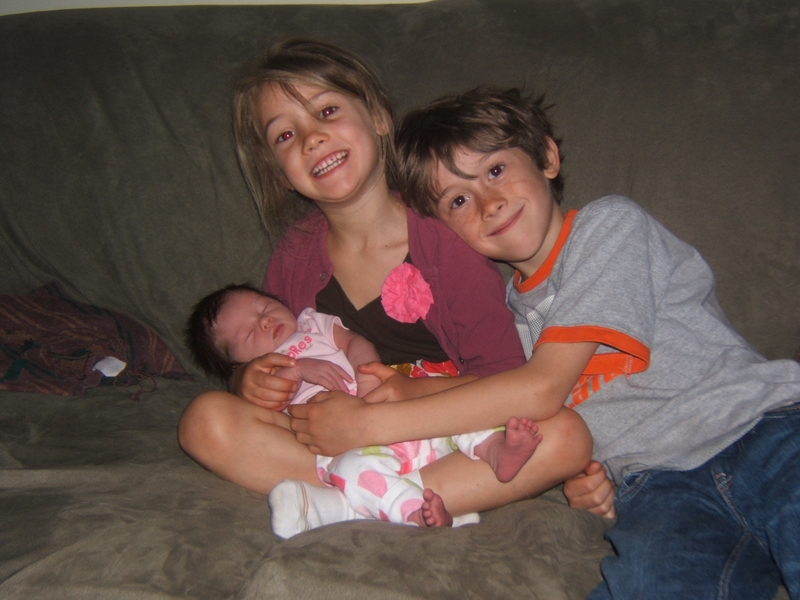 One of our biggest challenges so far this summer is parenting our older kids. The eight year old is finding his own path a lot more- not really into farm work, but loves to fish and read and check on groundhog snares and swim in the creek whenever anyone is on hand to watch him. This independence is awesome, but it has its limitations since it usually means he can entertain himself for quite a while, right up until he’s done and wants our attention immediately. That’s hard when you are unloading a hay wagon or talking to a customer and we are still trying to figure how to manage it other than just outright banishment from the farmyard. We’ve come up with a list of Morgan tasks- things that are fairly simple but that he can manage and pick away at on his own without a lot of oversight….he gets rewards when he finishes them, but since none of them are crucial or time sensitive, it doesn’t really matter if it takes a few days (or all summer). We’ve also given him permission to exercise his innate entrepreneurial skills- so don’t be surprised if you find him selling something either in the store or during CSA pick-ups. In all we are trying to make more space to play- to let go that the house isn’t clean or the laundry is piling up again- in exchange for being with our kids. And diapers, well- we are washing them and trying to keep on top of that for laundry at least. We figure that they will learn more being with us than being at camp or with a babysitter and they will especially learn that real life involves work and play and that you need to do both. On other farm news: the farm store is doing very well, we are adding new localvore products all the time to our own selection of pasture- raised pork, grass fed beef & lamb, plus seasonal veggies and our maple syrup. We are currently selling local cheeses from Cricket Creek Farm & Sangha Farm, ice cream from Bart’s Homemade, salad dressings, grill & BBQ sauces & specialty mustards from Appalachian Naturals, all natural & organic soap from Dancing Bare Soap, Vt Peanut Butter Company’s nut butters, Of the Wood Herbal creams & lotion, Giuseppe’s Wild Mountain Farm honey and more! We are here daily Mon- Sat from 8:30a-5:30p & Sunday’s from 10:30a-3:30p. We now have had eight calves born on the farm- we needed to do some major intervention with one new heifer, Flora, from Wheel-view Farm. The calf was presenting wrong and was totally stuck, but we called our vet, Yoanna Maitre, to the rescue and she got the calf’s hooves pointed in the right direction, got the chains hooked on and together with Tony & Jesse, got him out in time for him to be safe and sound. Thank goodness that Flora had been a well-handled bovine and happened to still be in the barn adjusting to her new home- we got the halter on her just fine which helped with her birthing and again later when we needed to tie her up just long enough for she and her calf to figure out the nursing relationship (she just was so glad that he was out that she couldn’t stop licking him long enough for him to get to her udder). It was quite an event, but definitely one that made us really really glad that we called Yoanna. We are getting more Clun Forest sheep! 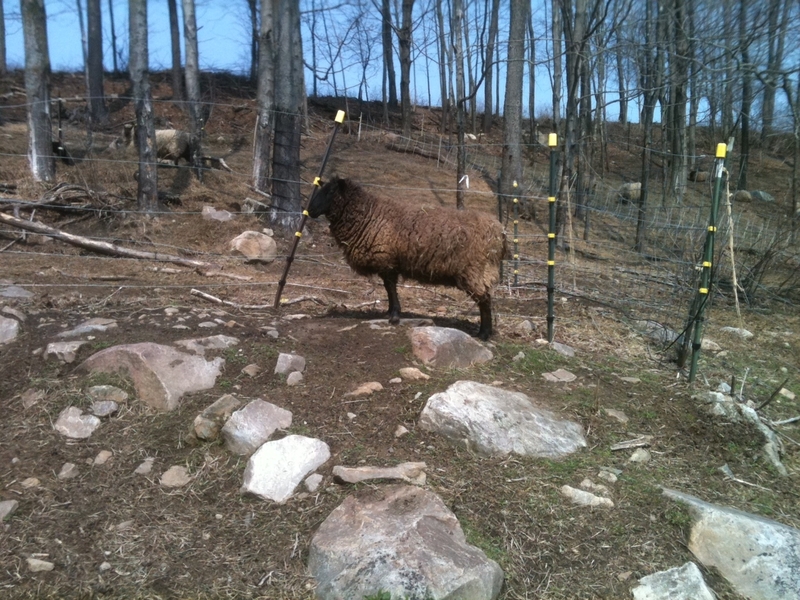 The farm has decided that more sheep are needed for lamb/wool production and for the great job that they do on r enovating/fertilizing pastures & hayfields and for clearing fencelines. So we called Mary at Rocky Top Farm in NY and asked her to give us all she could. We are driving up there next week to pick up 15 Clun ewes, 3 gorgeous crossbreeds from her grand-daughter (we have 2 of them here on the farm and we LOVE them too) plus all their lambs- a total of 43 sheeps! They will bring our current flock size up to 87 sheep including the lambs. We will also be adding a beautiful Blue-Faced Leicester ram lamb from Cranberry Moon Farm to our flock- he will be used mainly for breeding to Cluns to produce ‘Mules’ (a specific hybrid used for breeding to a larger boned meat breed such as a Texel to make larger meatier lambs that still perform well on grass alone), but as he is a gorgeous silver, he will make incredible fiber producers as well. The pigs are out on pasture grazing in the forage field that we planted for them. We had a smaller than expected litter from Lilythis spring, a larger one from Bela and none yet at all from Tulip (we hope that she is bred!). In any case, we kept back two promising young gilts from Tulip’s fall litter- Rose & Petunia (of the beautiful eyes) and are looking for a new boar for this fall. If you have a chance, come by and visit the new store and say hi! Gwyn and Des are usually there most of the time. Farm Store Opening July 2! On Saturday, July 2nd, we will be firing up the grills and the tractors in honor of our farm store’s first opening day. There will be hayrides and tastings. The festivities start at 10am and run until 2pm. Our new store will feature our own meats, produce and yarn along with other locally made and grown products. Come by and celebrate with us. to go into your garden. exciting new varieties as well as mystery packs for the adventurous! Vegetables: in 6 packs, 4 packs and 3.5″ biodegrabable pots (OMRI-listed)- Tomatoes (determinate & indeterminate, hybrid and heirloom in cherry, sauce, salad & slicers), peppers (sweet red bells, pimentoes, sweet fryers), chiles, cucumbers (pickling & slicers), summer squash & zucchine, pumpkins, winter squashes, mixed lettuce packs, kale, chards, broccoli, cabbage & brussel sprouts. Onions & leeks available as bundled starts. Seed potatoes in many colors & textures. We always get asked what it is do farmers do in the winter? Do we take it easy, slow down, go on vacation or what? Well, there hasn’t been a whole lot of slow down this winter. To some extent, we have to, there just isn’t enough light in the day to work as much outside as we normally do and it is and has been very cold, snowy or windy and that takes more energy out of you than the hot summer sun of August. So even if you can only work for 6-8 hours, it still feels like you worked twice that. We have chores every morning- pigs, sheep & cattle need food and fresh water (though the sheep seem to prefer to eat snow most of the time) and that doesn’t include plowing snow whenever needed so that our employees and stable manager can get in to do their own chores. This winter, we fill the rest of the day with construction whenever feasible- the farmstand got its roof and is now completely enclosed and the root cellar stairs are done. 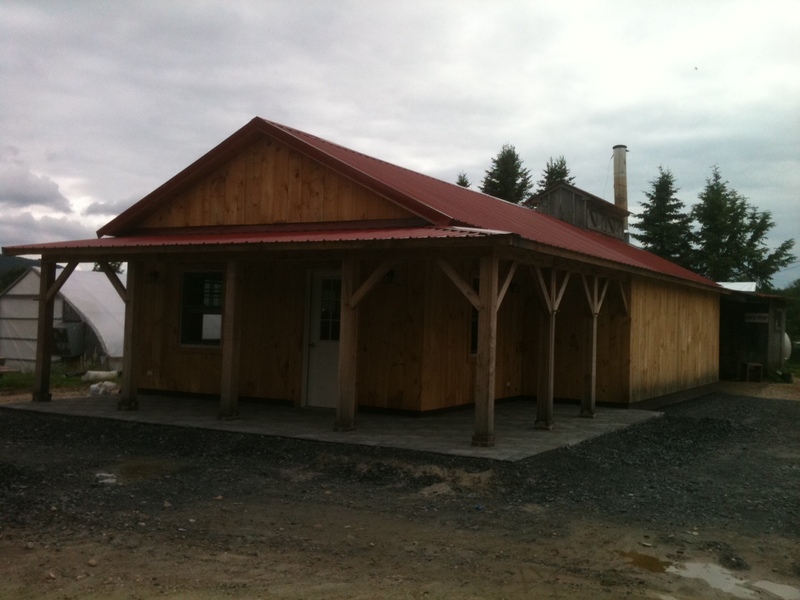 We are waiting to put in windows and finish siding until we get the barn more complete. The new barn has most of the hay mow finished and the exterior walls are mostly up. We’re waiting on some lumber to finish getting milled and delivered before finishing the interior pens, the rest of the mow and the roof rafters (we didn’t want to put on the roof until the mow was finished- it is a LONG way down otherwise). Lots of planning, accounting and meetings also happen in the winter- enough to try and set up as much of the coming season as possible so that we don’t have to stop in the middle of a project. Also winter is when the farm makes firewood happen from our sustainably managed woodlot, cutting the next season’s wood and making seasoned wood for delivery. 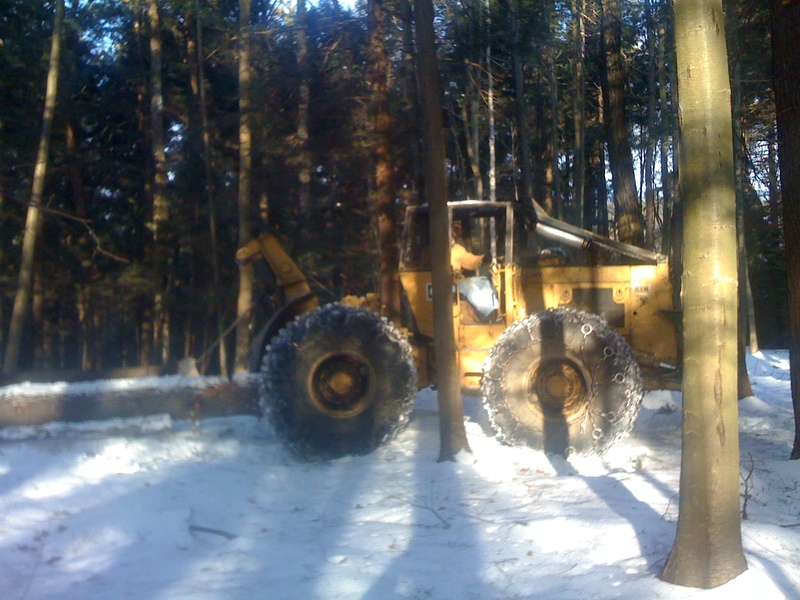 Logging is easier when the forest floor is either completely dry or frozen solid. We are currently logging in a section of woodlot close behind the main farm- bike & horse trails cross through it, and it will look a lot different in the spring. When Dicken and Seth log, they are clearing trees that are mature and ready for harvest, but also thinning out scrubby or unhealthy trees and leaving the most gorgeous trees as seed trees to promote healthy, vigorous saplings and the varieties that we are looking for. 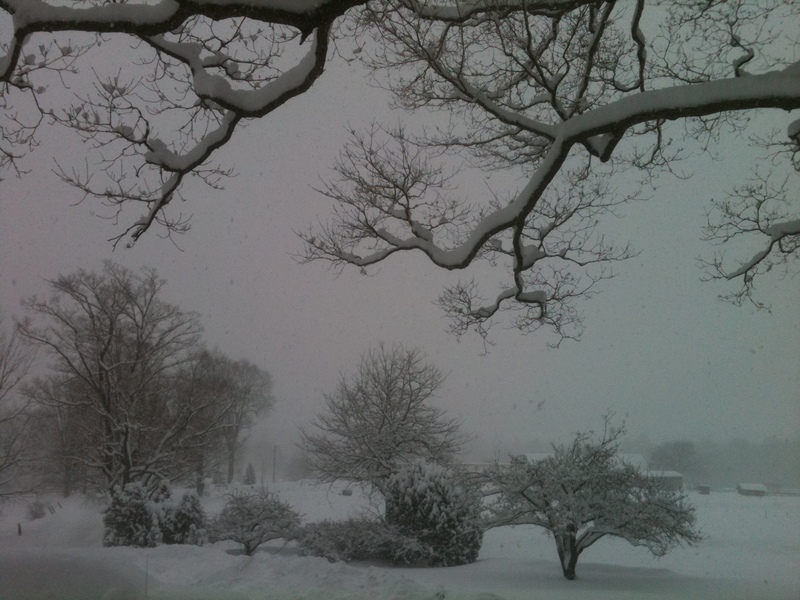 This winter has brought frigid temperatures and lots and lots of snow so far. Great for those of us who like winter-time snow activities such as sledding, skiing and skating- but not so great for finishing barns. 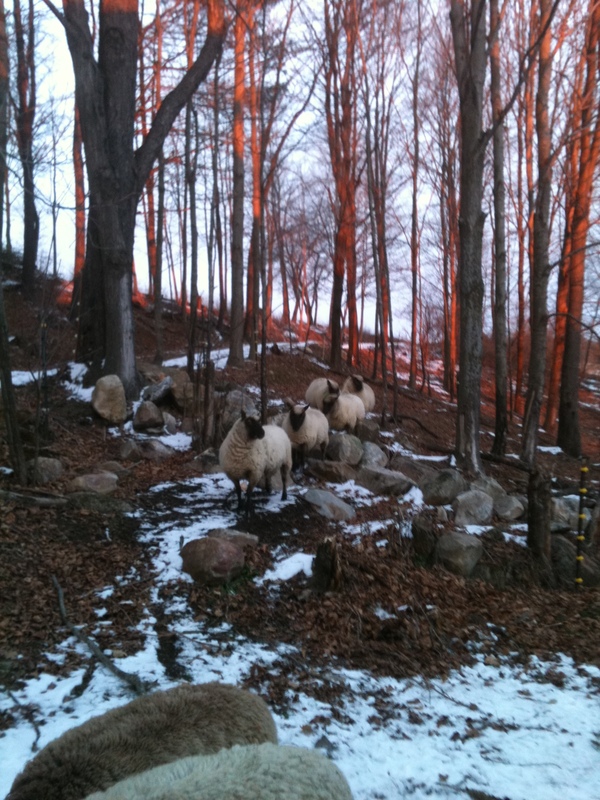 The sheep seem to hardly notice the weather- they have free access to a nice warm barn whenever they would like to be inside, but we rarely ever find them in there whether there is freezing rain or a foot of snow. We’ve even taken to feeding them in the barn whenever there is a threat of inclement weather- they come inside to calling for their hay, usually covered in a couple of inches of snow and look disgruntled when it starts to melt. 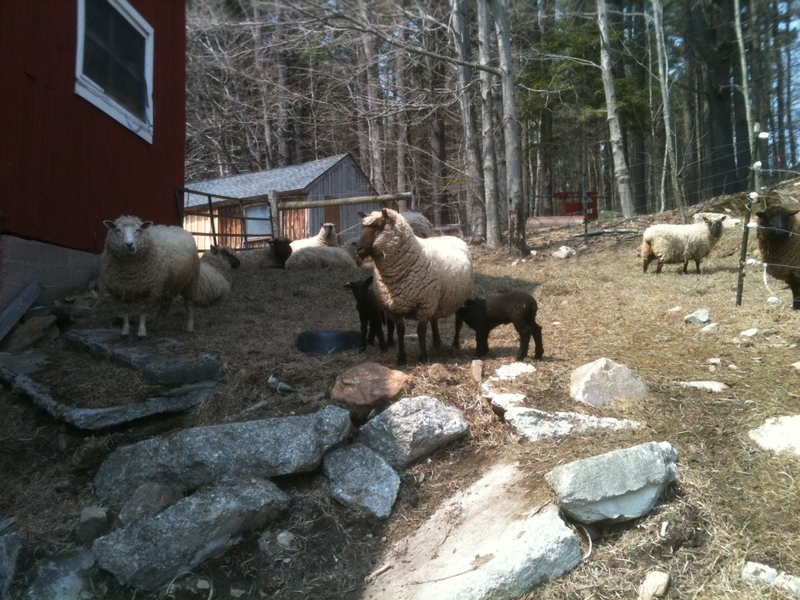 The ewe lambs actually started to shed a little wool when we were bringing them inside every night at the beginning of the winter (their mommas were up in a higher pasture with the ram and we were running separate flocks). Keep in mind, this barn is not heated. The flock has been reunited (the ram, Arlo, is back in his own paddock with his buddy Leo) and now there is outdoor access round the clock and everyone prefers to sleep outside. Lambing is scheduled (HAH!) to begin in mid-April as things hopefully warm up a little. Of course, some of those girls out there are looking mighty huge already and we wouldn’t be at all surprised if we have a few earlier lambs in the group. 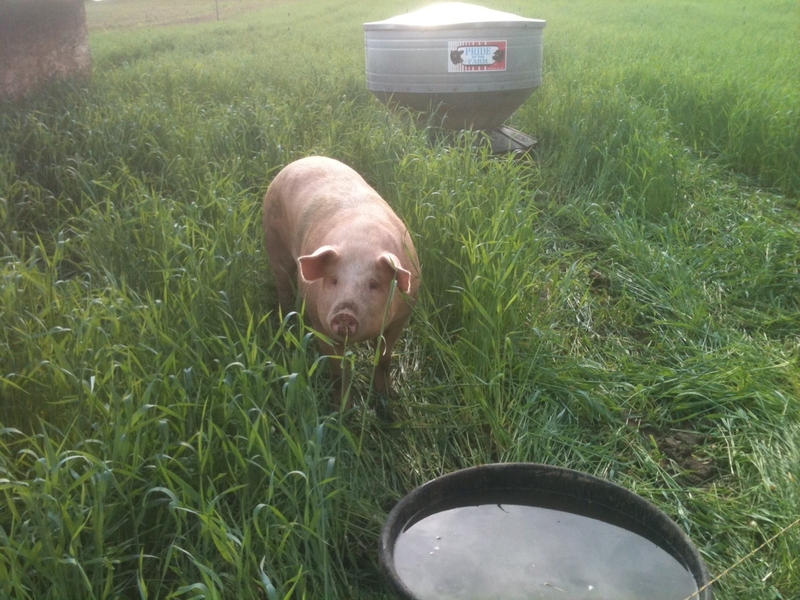 Pigs are still out on pasture for the next week while we finish up pens for them in the new barn. The barn isn’t finished yet, still lacking a roof, but the hay mow is finished enough to provide adequate shelter from the elements. As soon as the pens are built, we will march the pig herd down the road and into their new quarters, just in time for the four sows to farrow their newest litters of piglets. (Yep. these are the spring feeder piglets, call us now to put in your orders). We just moved the cattle down from the upper Turkey Field pasture this past week where they have been since the end of October. The picture of Sweetie’s calf on the left was taken the day after we moved them up to that field (the day this little guy was born) when we had an unexpected cold snap and the wind chill rates reached 15-20 degrees. 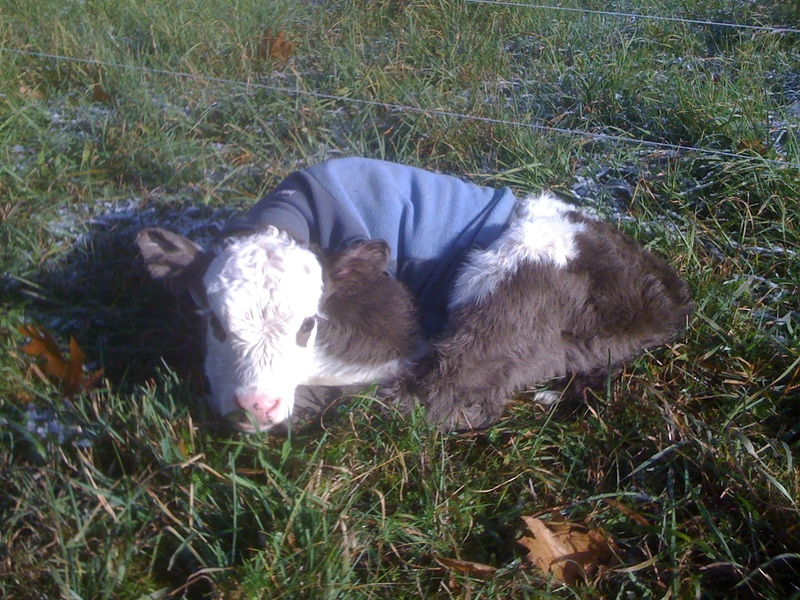 We were so worried about this brand-new wet calf that Jesse took a fleece vest of Morgan’s up to the field in the middle of the night andwrestled the calf into it. 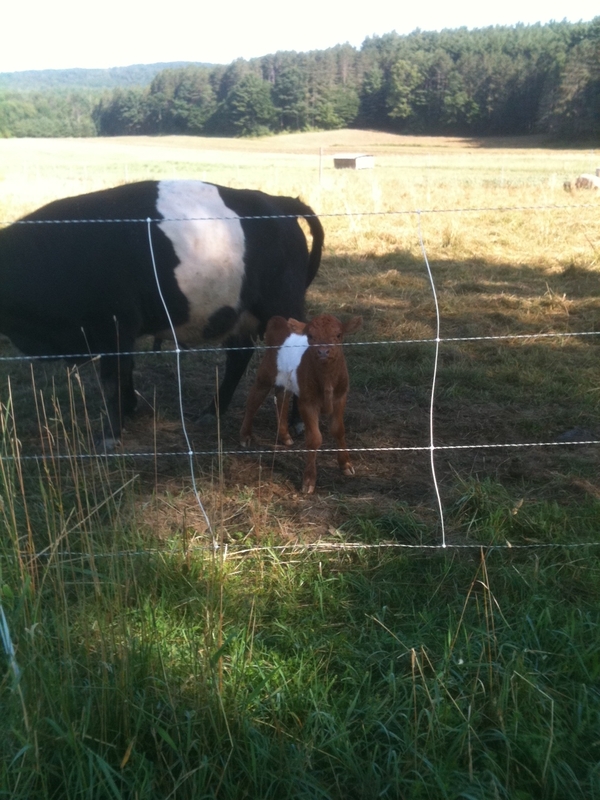 It worked wonders and the next morning (chilly as it was) found a frisky calf gamboling along after his mother. He wore the vest for the day and Jesse took it off the day after- it needed a good washing and then Morgan wore it to school soon after. CSA brochures went out in the mail at the beginning of last week, we hope everyone got theirs. If not, give Desiree a call and she will get one out to you. The sign-up form will shortly be available here on the blog. If you need extra brochures for friends, co-workers or have a good spot to put them out, let us know and we’ll send you a batch. We hope that you are all looking forward to delicious, fresh veggies as much as we are! 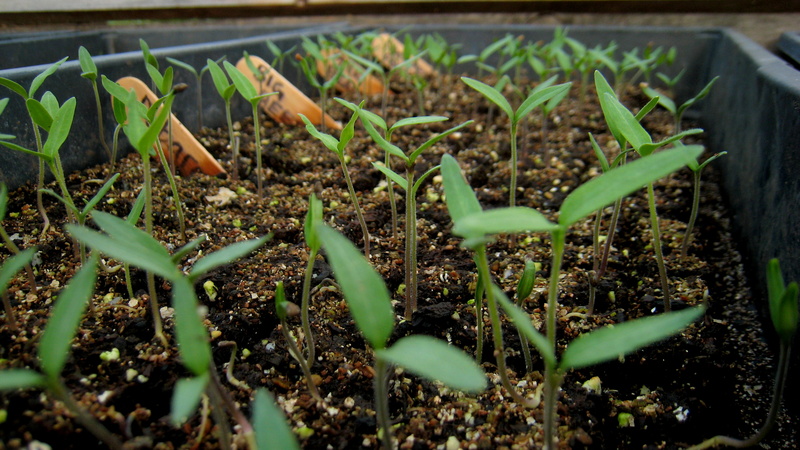 If you would like to help out with seeding in the greenhouse, we’d also like to know- we get started with that in March! We started our first experimental wintertime CSA extension in Nov & Dec of 2010 where we offered a boxed share every other week and we think that we will definitely be doing it again and more extensively for 2011- this is not on the Summer CSA sign-up form, but will go out to this season’s members later in the season. We had a lot of fun making and packing boxes- we learned a lot about what worked well and what could have been better. We will solve most of our problems by just having the hoophouse finished, full and ready to go (and with the plans already in place and seed ordered and planting scheduled- we will definitely make it happen) and the quick hoops tunnels fully installed over beds of field veggies (and all up by the hoophouse which will make getting to them easier). 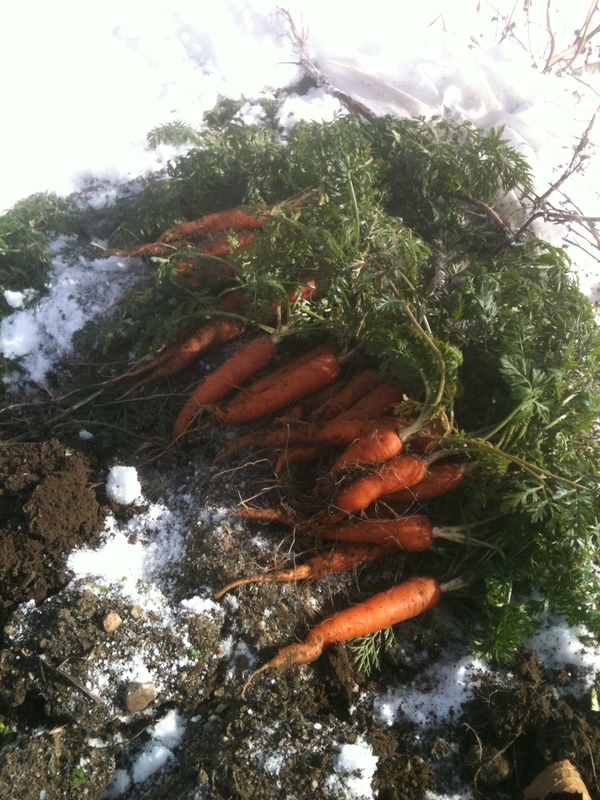 We still don’t know how well things have overwintered with the frigid temperatures, but we have our fingers crossed for early early spring veggies. Desiree has been spending the last month organizing field rotations and plans for the 2011 gardens, she’s also been ordering seeds and supplies,planning greenhouse rotations and making seeding charts for the garden transplants and for the 3rd annual Plant Sale coming up in May. Look for postcards in the mail about the sale- we’re making it bigger and better this year, with lots of great bedding plants and veggie starts. We will soon be gearing up for sugaring season, let’s all keep our fingers crossed for a great syrup run this year- it has been a little disappointing the last couple of years and we’ve sold out of most of our syrup before February rolls around again. Lots of work has been getting done on the sugar-bush throughout the fall- replacing parts of the saplines and making lots of repairs, hopefully this will make for a better season (that and no January thaw might mean we actually get some of the lighter grade syrups for a change). Want new posts sent directly to you?